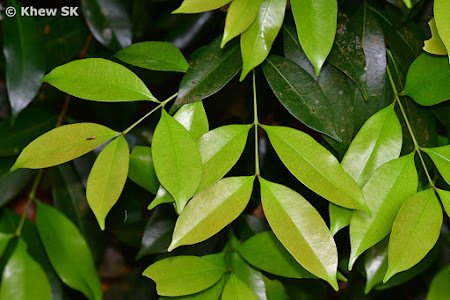 In the animal kingdom, abnormalities caused by genetic mutations or disorders give rise to aberrations or mutations that are physically different from the norm. 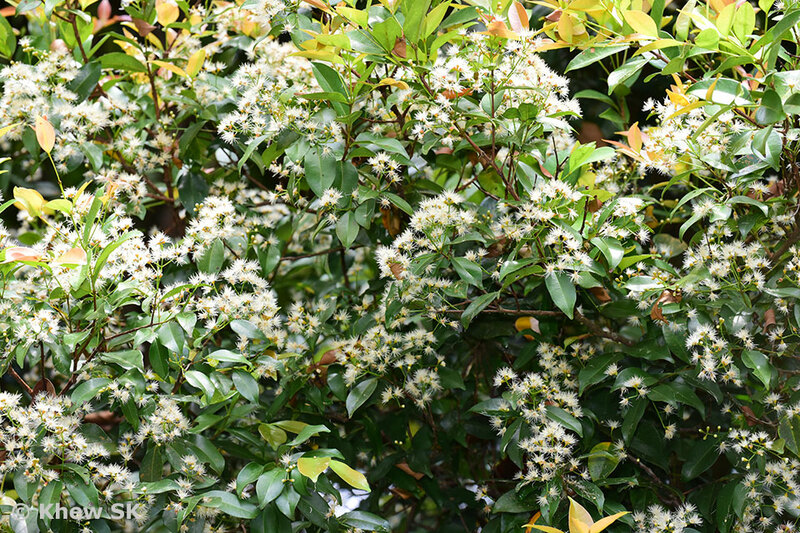 The more well-known disorders like albinism (the lack of pigmentation in humans and animals), dwarfism (severely restricted growth, leading to smaller than usual individuals), Down's Syndrome (intellectual disability and characteristic facial appearance), polymelia (born with additional appendages) and too many others to discuss here, have been well-documented in genetic science. 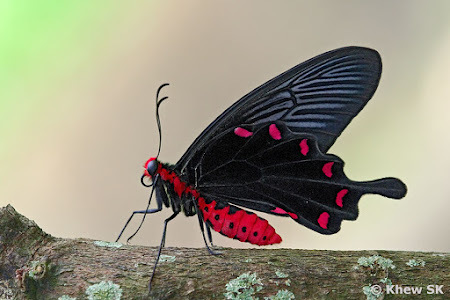 Aberrations in the butterfly world are not rare as thought. 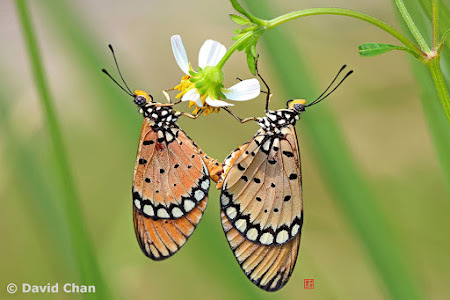 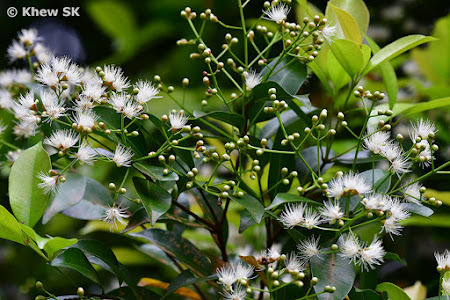 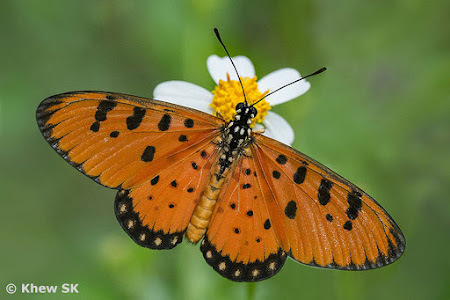 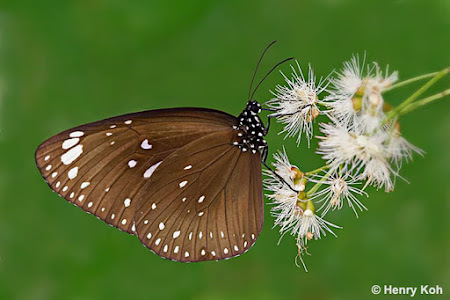 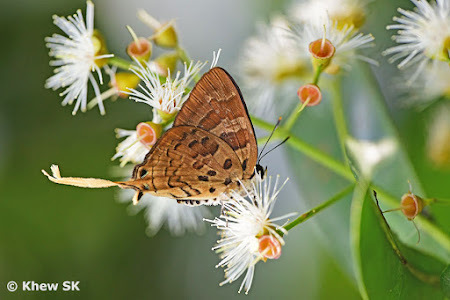 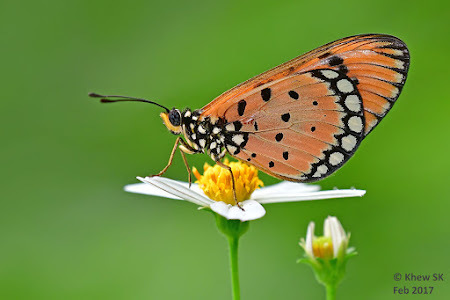 The number of photographs of aberrant butterflies that can be found on the Internet, ranging from minor to extreme aberrations in wing patterns and shapes, is evidence that aberrations are relatively regularly encountered in the field. 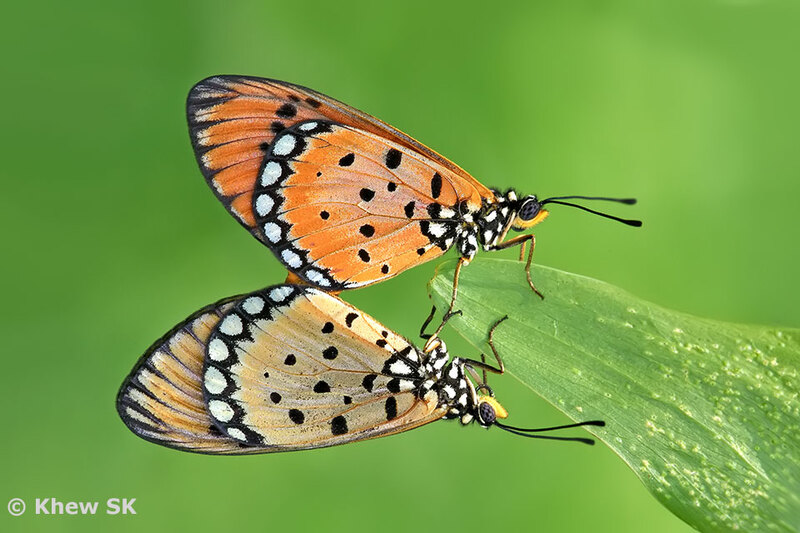 An aberration is a variation in the wing pattern of a butterfly species which is different in some way to the normal pattern. This can occur as a genetic or environmentally produced/induced variation of the usual form of the species. 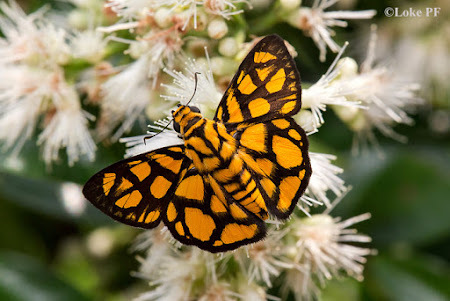 Some aberrant forms although rare, recur on a fairly regular basis and have been documented as new "forms" of a butterfly species. 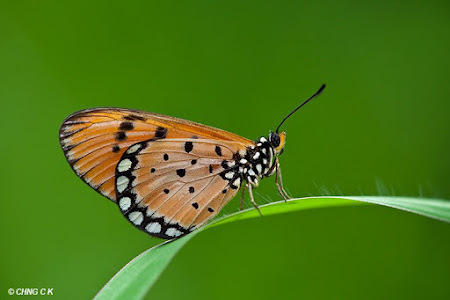 An aberration of the Branded Imperial where the dorsal side of the hindwing appears to be orange. 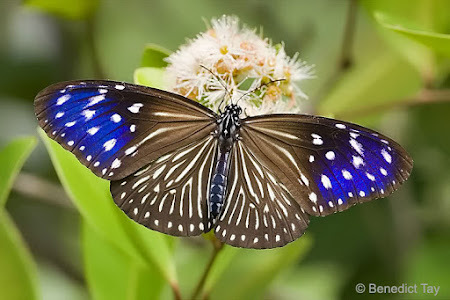 In normally-coloured individuals, the dorsal side of the hindwing is black. 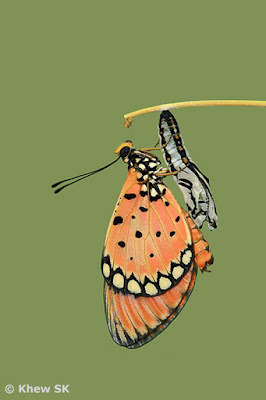 Butterfly aberrations may occur for a variety of reasons - for example, extreme temperature changes especially while the butterfly is developing during the pupal (chrysalis) stage may cause aberrations to occur. Very cold conditions can produce very dark forms of some species while heat shock may cause dramatic changes in wing pattern. 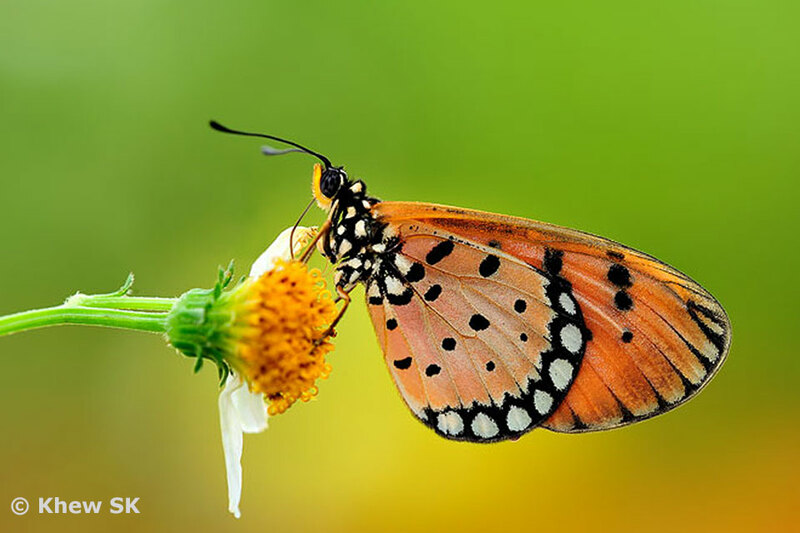 Research that subject pupae to cold shock have yielded a wide variety of aberrant patterns and colours in butterflies' wings. 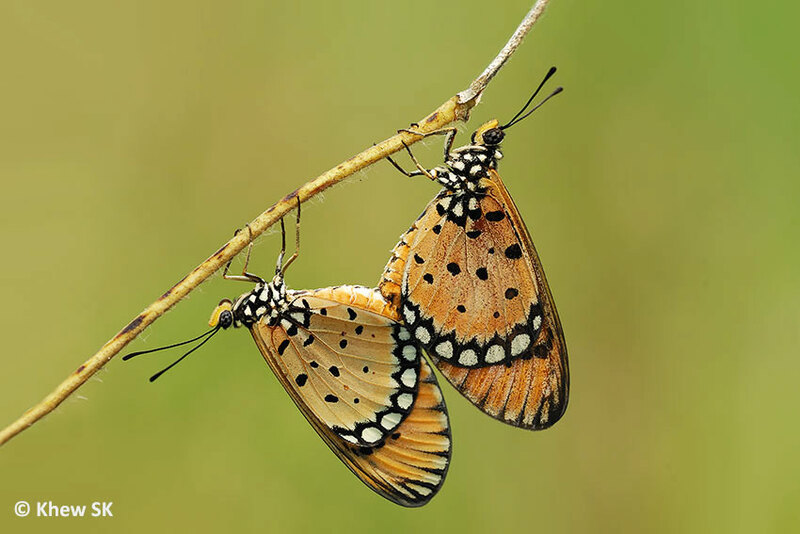 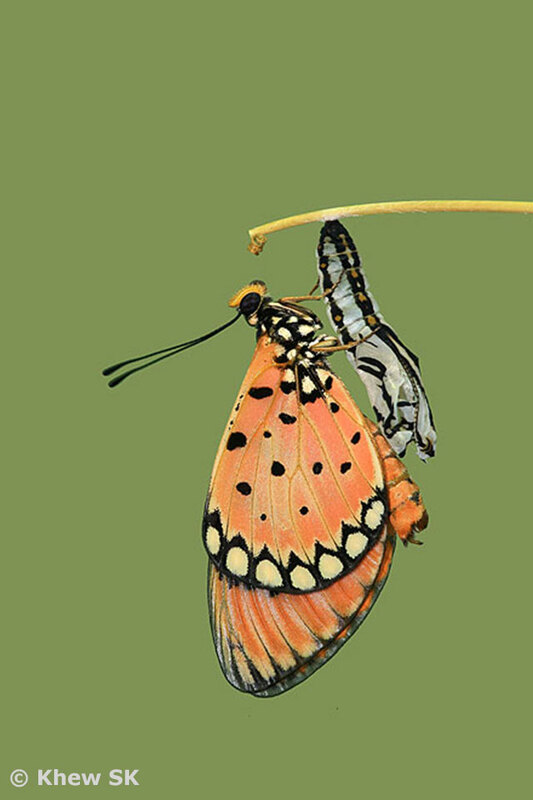 In some extreme research, chemical injections into caterpillars and pupae to catalyse change in the butterflies' wing patterns have also been carried out in controlled environments. 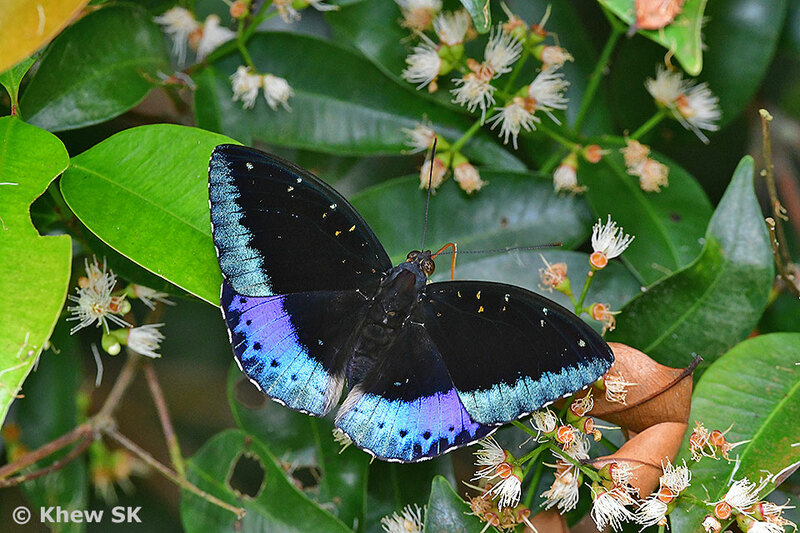 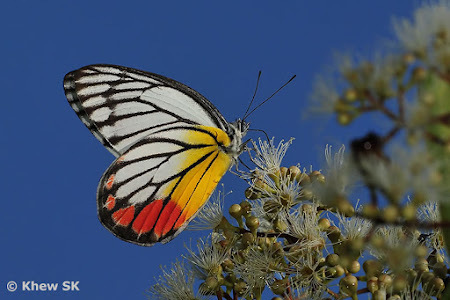 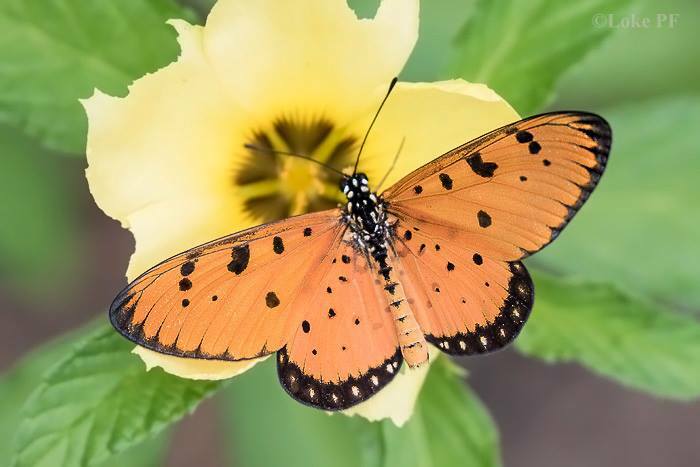 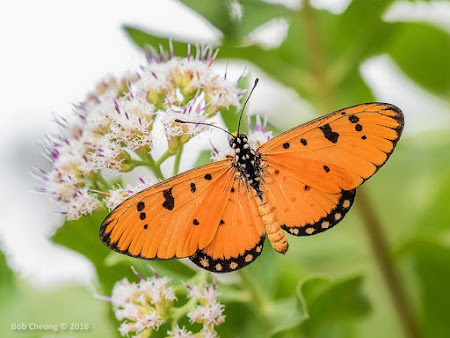 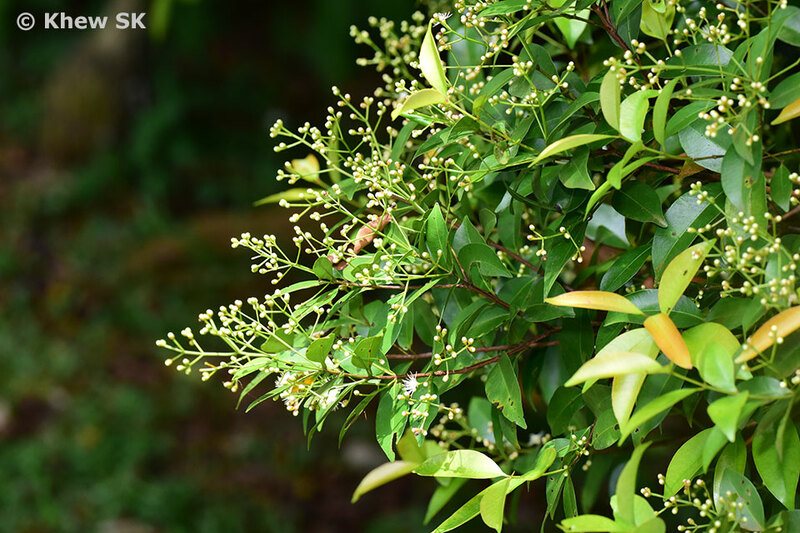 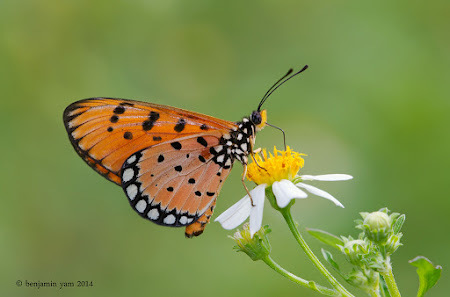 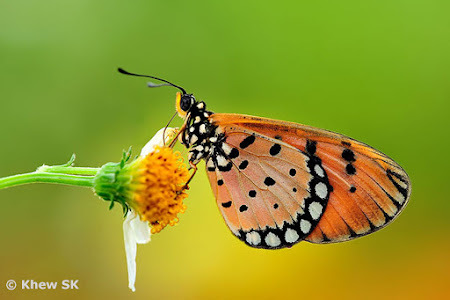 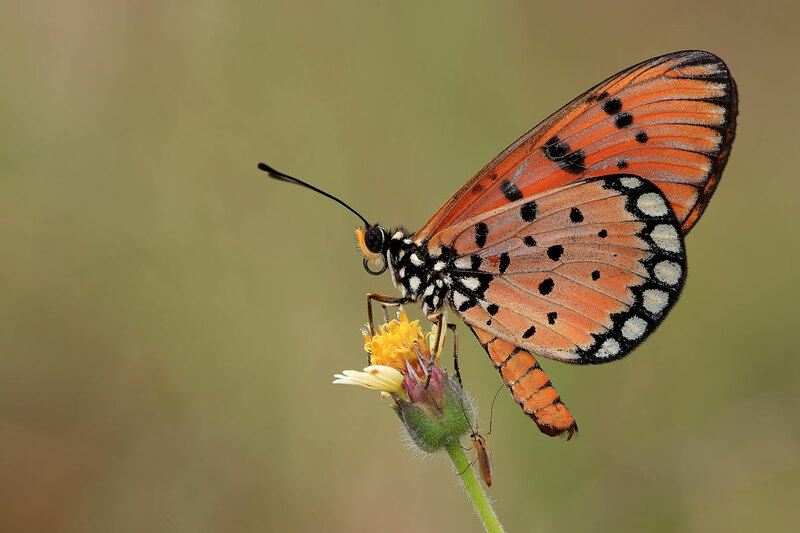 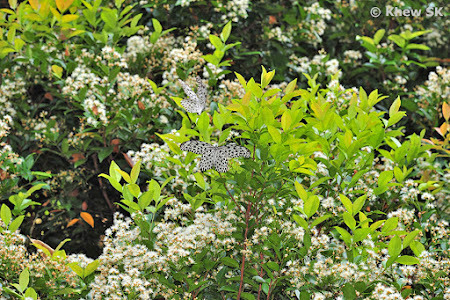 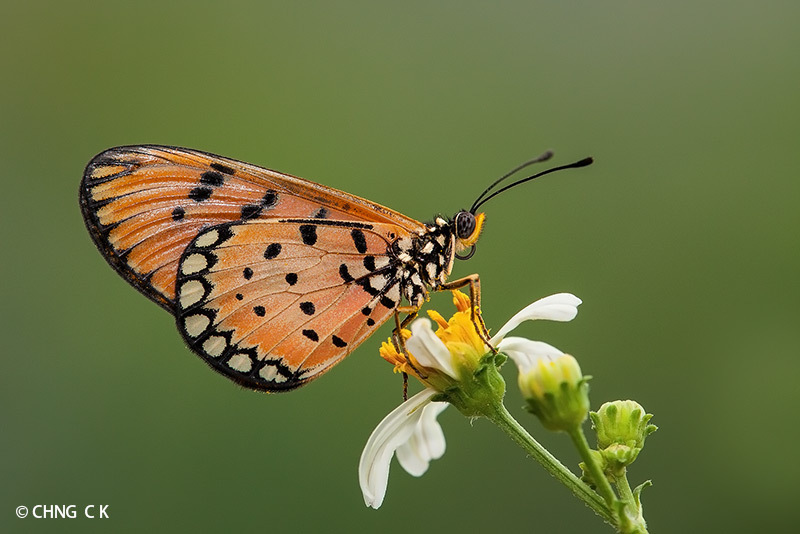 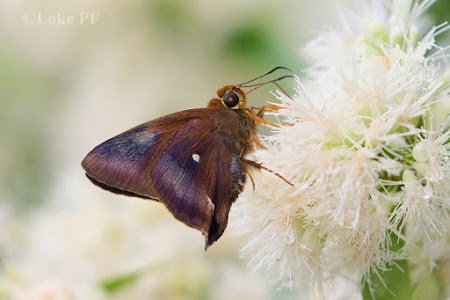 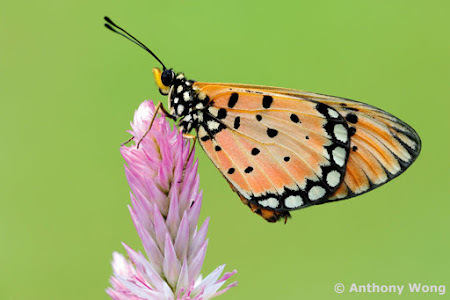 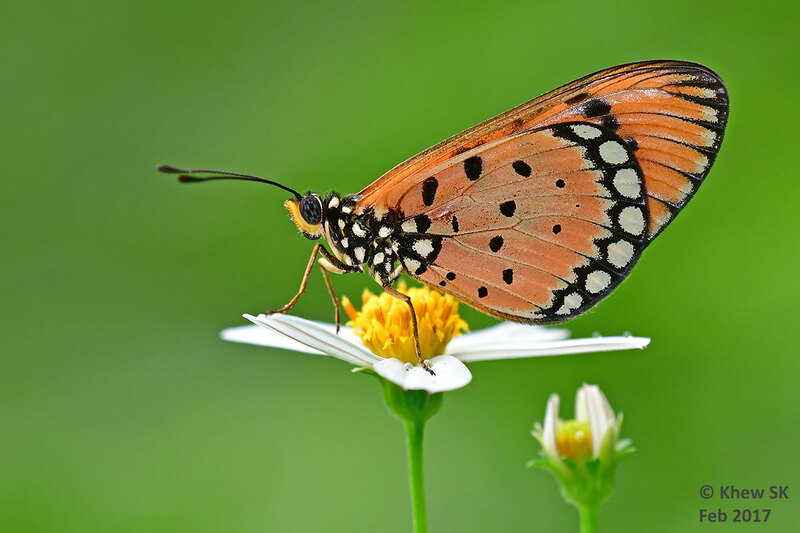 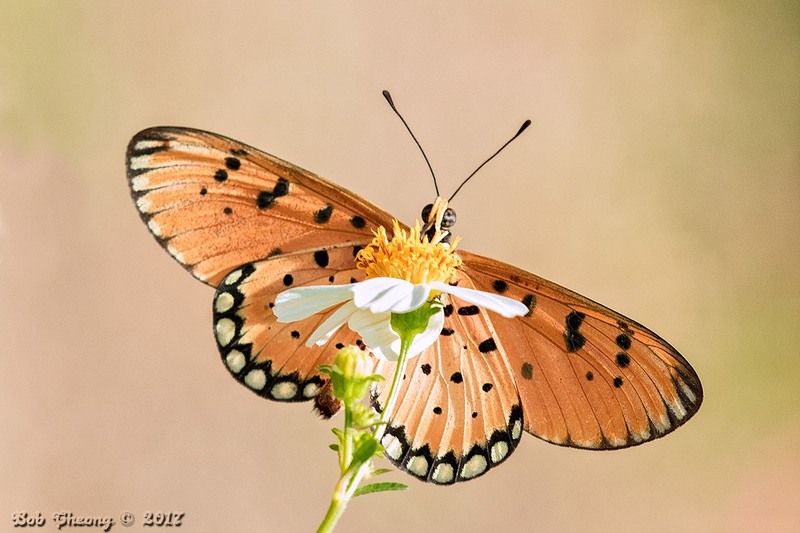 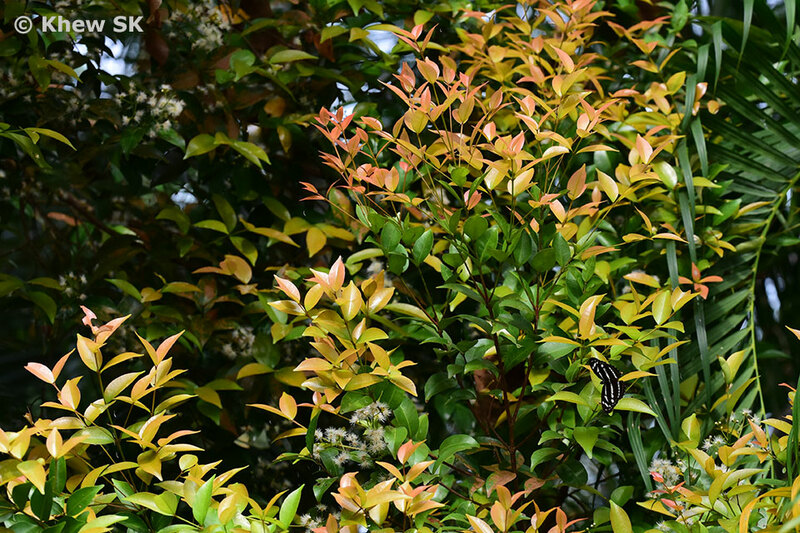 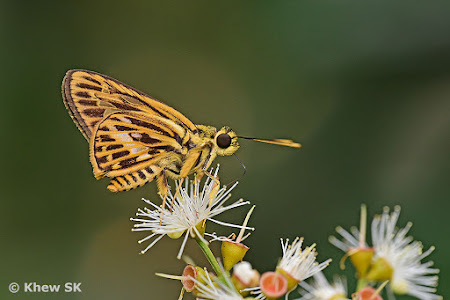 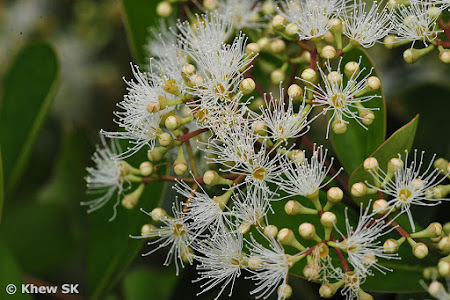 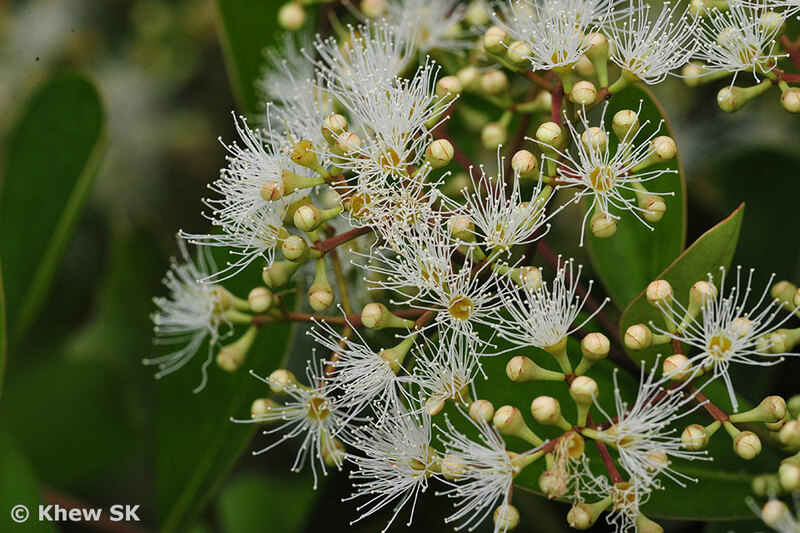 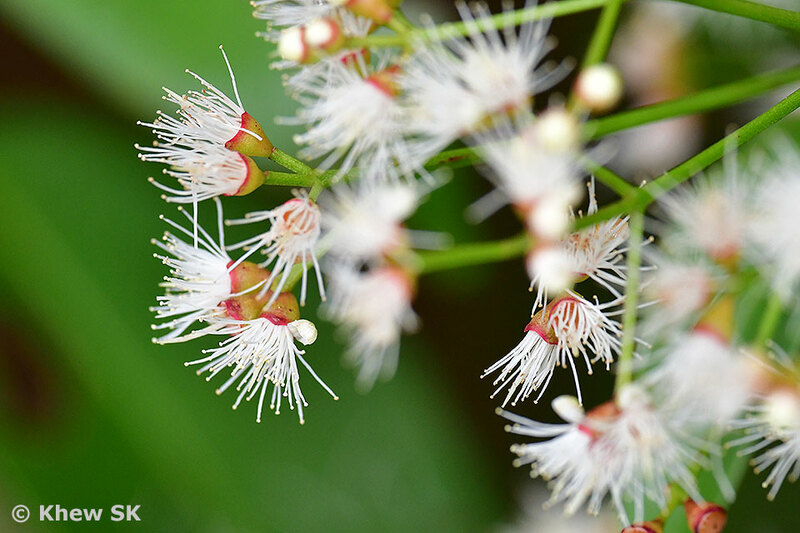 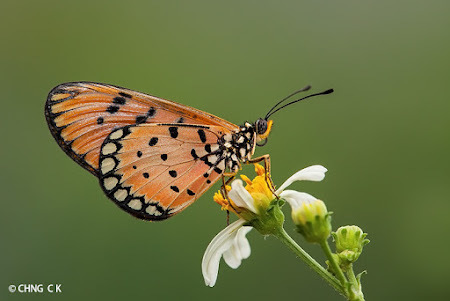 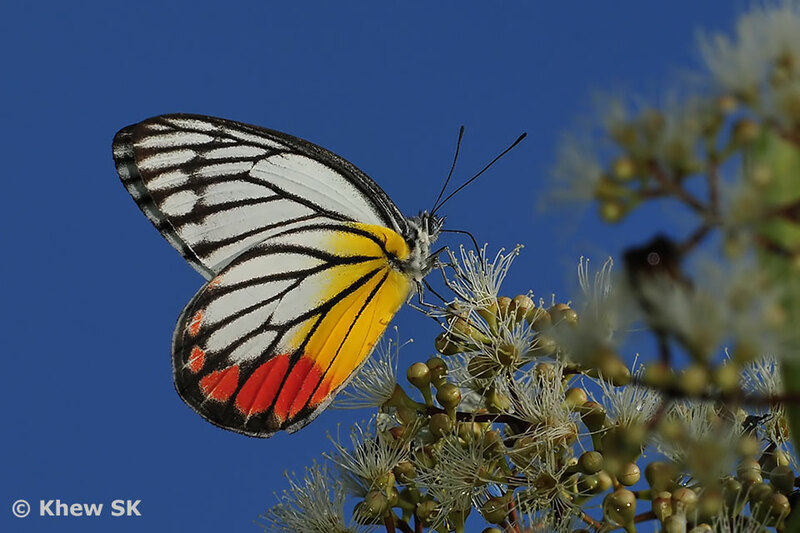 This article discusses and showcases examples of aberrant butterflies that have been observed in the field, that appear different from normal individuals of the species. 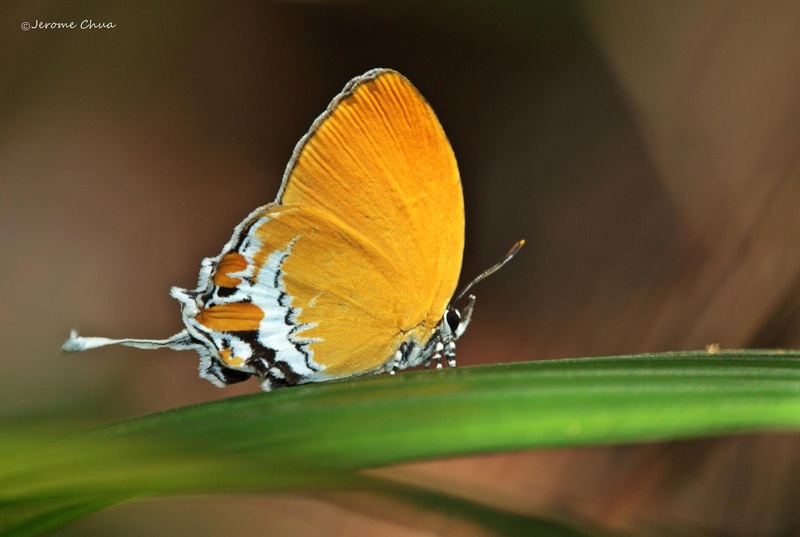 Amongst the Papilionidae, there have been cases of minor variations observed. 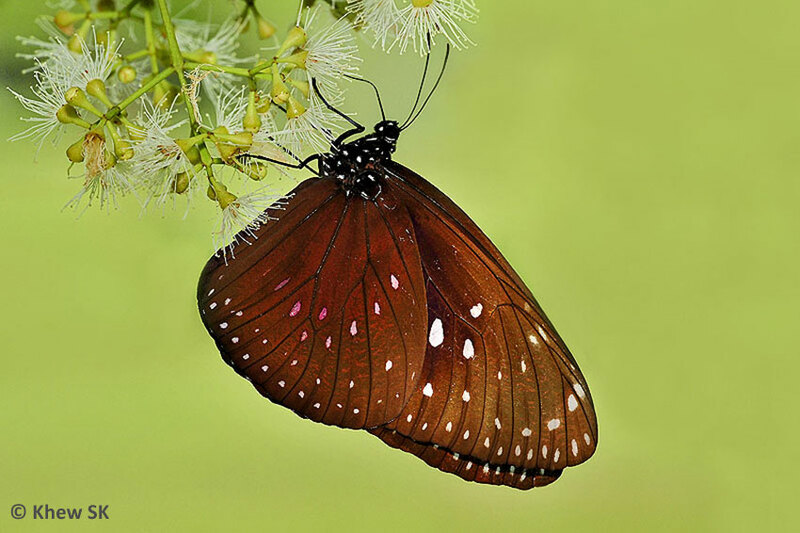 However, one such case stands out as a striking example of an extreme aberration. 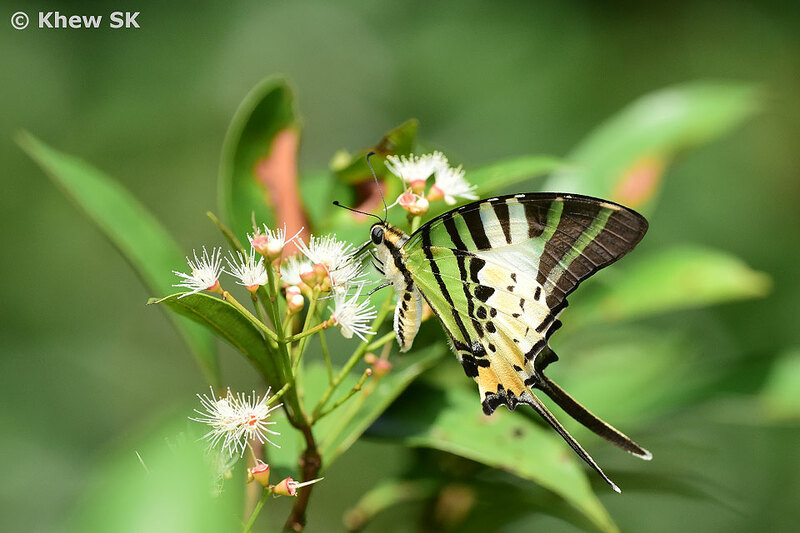 In the case of the Bluebottle (Graphium sarpedon luctatius) encountered, the macular band across both wings has merged with the wing borders and the absence of the usual blue colour gives it a totally different appearance from the norm. Minor aberrations in the spots of the Eurema spp. 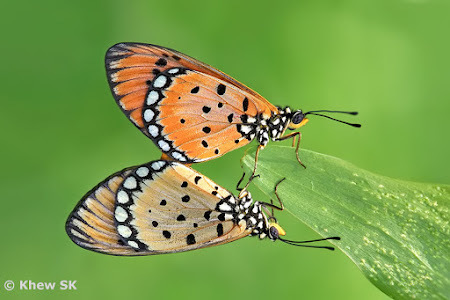 is quite regularly encountered in Singapore. 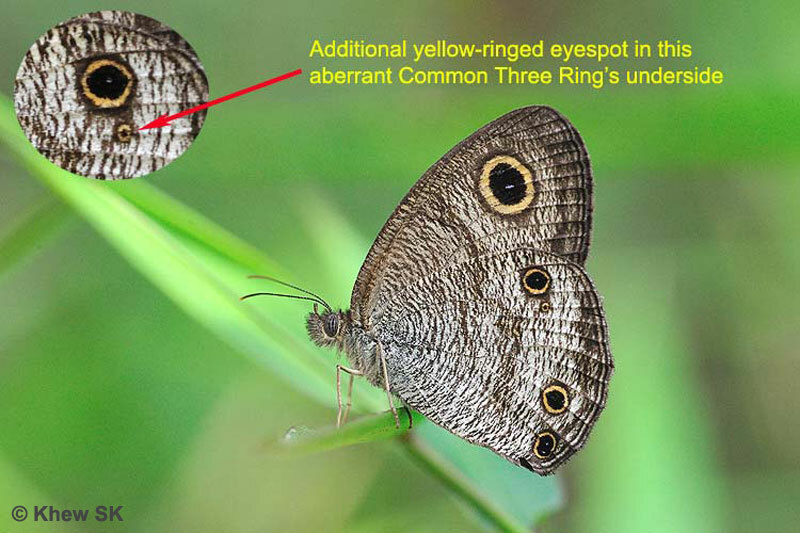 The absence of the diagnostic cell spots in these Grass Yellows often cause confusion as to what species has been observed. 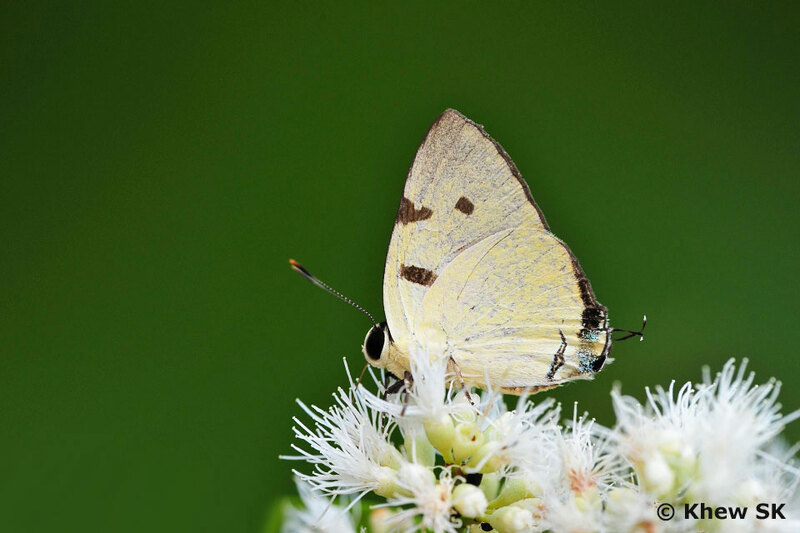 In the example shown above, this aberrant Common Grass Yellow (Eurema hecabe contubernalis) shows a total absence of its cell spots and the lack of other spots and features on the wings make it appear like a different species from the normal butterfly. 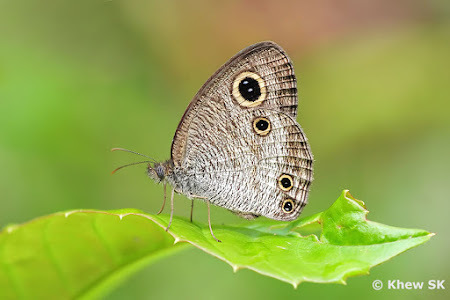 Amongst the Satyrinae, aberrations in the form of additional ocelli has been regularly documented in the Ypthima spp. Examples of the Common Three Ring and Common Five Ring are encountered so regularly with additional ocelli that this phenomenon is taken as "normal" that some individuals sport these extra eyespots. 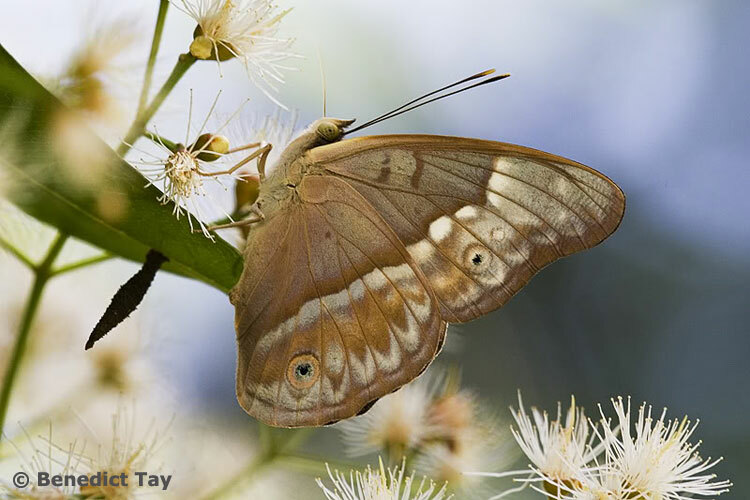 This strange looking aberrant Malayan Bush Brown (Mycalesis fusca fusca) sports a marginal black band on both its wings. A normal individual does not have this dark band, but instead has marginal and submarginal zigzag lines which are completely absent in the aberrant individual. 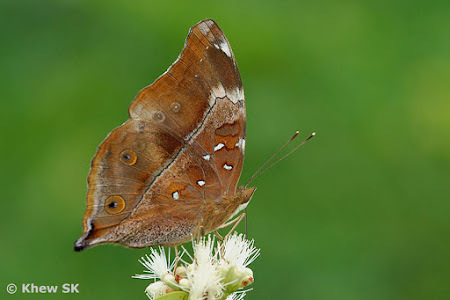 This aberrant Peacock Pansy (Junonia almana javana) with a reduced or absent large ocellus on the hindwing makes it appear very different from a normal individual of the same species. The ocelli on the forewing also lack the blue and white highlights of a normal Peacock Pansy. This rare aberrant Malay Viscount (Tanaecia pelea pelea) with the highly diffused forewing markings and reduced cell spots makes it appear like a different species at a glance, when compared with a normal individual of the same species. 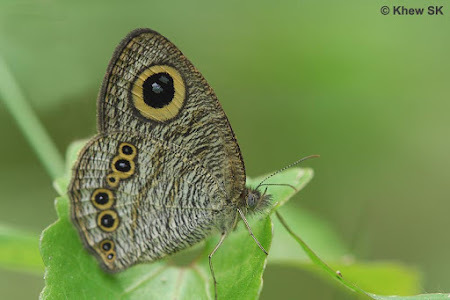 In this case, the aberrations are limited to the forewings only, as the hindwings appear quite normal with the usual markings of the species. 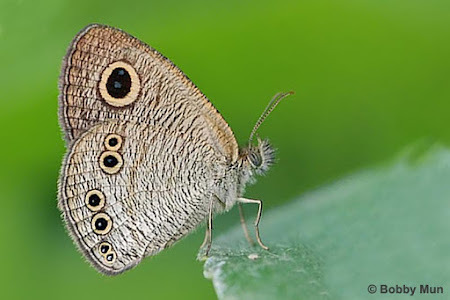 Aberrations amongst the Lycaenidae appear to be quite regular amongst the Polyommatinae species. 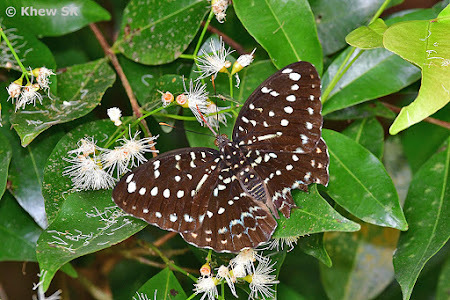 The variations in these aberrant individuals can range from a heavily darkened wings with heavier markings to additional spots and diffused striations that make the aberrant individual appear like a totally different species. 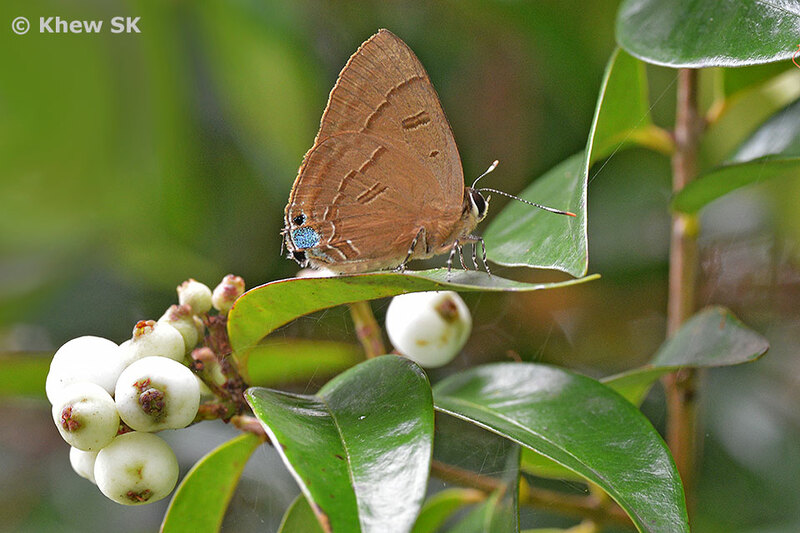 In the example above, the Common Hedge Blue (Acytolepis puspa lambi) on the extreme left appears very different from the normal example on the right. 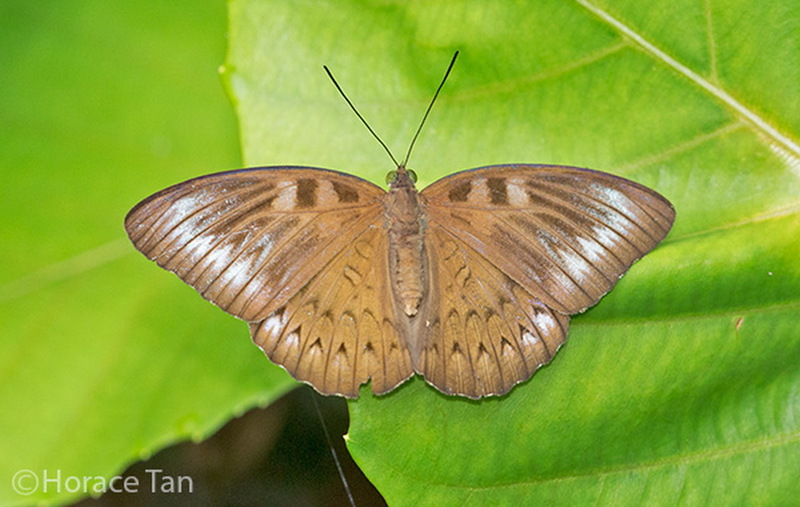 The middle specimen has conjoined spots on the hindwing. The Malayan (Megisba malaya sikkima) depicted above also shows a range of variations from left to right, showing examples of melanism in their wings that suggests a different species, if not carefully scrutinised. 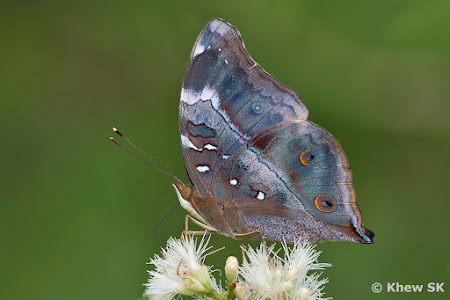 This example of a Pointed Ciliate Blue (Anthene lycaenina miya), an aberration with distinct diffuse white markings on both wings makes it appear very different from a normal individual of the same species. 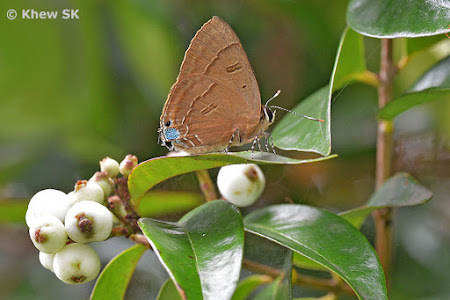 The aberrant Cycad Blue (Chilades pandava pandava) with an extra large black apical spot on the hindwing and the suffused markings on both wings depart quite significantly from the normal butterfly's wing markings. 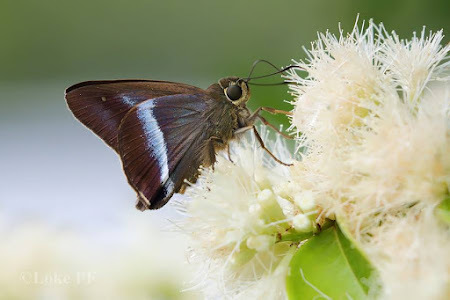 And finally, amongst the Hesperiidae (Skippers), aberrations are also known to occur. This bred female of Quedara monteithii monteithii appears to have an extra white patch on its hindwings, whereas a normal female features an all-brown hindwing. 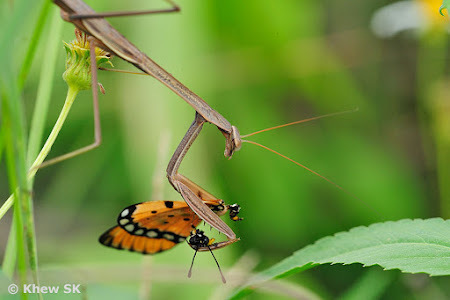 The aberrant female appears like a different species. 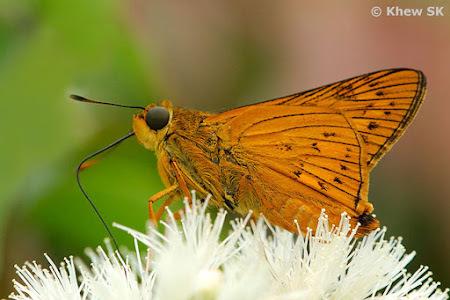 In the above example of a Plain Palm Dart (Cephrenes acalle niasicus) this aberrant individual lacks any of the normal black arrow-shaped markings of a normal individual of this species. Its paler than usual orange colour for this male plus the strange patch that lacks any wing scales whatsoever gives this aberrant individual a very strange appearance.